Medical homecare equipment needs to be many things – durable, comfortable, waterproof, chemical-resistant, lightweight, and soft touch. Our injected molded foam products have it all – and more! These properties are the main reasons why the largest companies of the medical sector call on our high-quality EVA foam manufacturing technology. Let’s take a closer look to the benefits of molded foam products in the medical industry. A molded foam product can be both durable AND comfortable, and it must meet the highest standards, needs and expectations of our clients – and their end-users. Not only our molded foam products are durable and comfortable, they are also much superior to regular molded EVA foam, and they are esthetically nice. Moreover, the durability brought by our custom and self-skinning foam molding does not alter the overlook of our finished medical equipment. 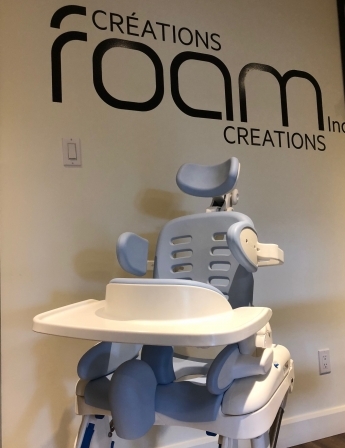 And on top of that, the fact that our injection molded foam products are soft and lightweight brings an added comfort to your end-user compared to regular molded EVA foam. Any medical equipment needs that plus-value! Needless to say, being water-resistant is a make or break condition for any medical homecare equipment. Since our XL EXTRALIGHT® injection molded foam products are made with a closed-cell and cross-linked technology, they can be cut, scratched or twisted, and they will still remain 100% waterproof. We guarantee that not a single drop of water can go through our high-quality EVA foam molding. This property becomes even more important – not to say crucial – when it comes to washing your foam injected products, whether you use water, soap or chemicals. Indeed, our top-quality EVA foam injection molding process makes every single one of our products 100% waterproof, as well as chemical-resistant for sterilization. In environments like hospitals or specialized health care establishments where germs can be everywhere, we understand how important it is for our clients to have the highest quality of easy-to-clean reticulated foam material. For example, the EVA mold injected foam is perfectly designed and suited for people suffering from urinary incontinence since any involuntary leakage can be easily cleaned with water and/or chemicals. And above all those great properties, our XL EXTRALIGHT® mold injected foam is free of phthalates, heavy metals, vinyl chloride and latex, which makes it very safe for our clients and their users, but also eco-friendly.